RoadTrip supplies the full range of HELITE airbag technology clothing. 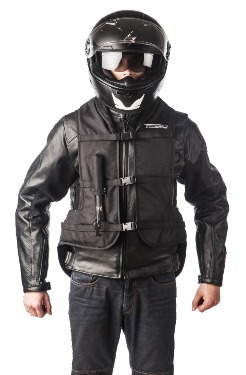 RoadTrip is the first motorcycle rental company in the UK to offer this kind of safety equipment to riders. At RoadTrip we stock a full range of sizes of HELITE motorcycle airbag vests for sale and rental, with or without a motorcycle hire. We can also supply the rest of the full range of HELITE safety clothing. *Deposit pre-authorised against a card, so not a payment. EXCLUSIVE OFFER to RoadTrip Customers for HELITE Airbag vest rental: Try before you buy. If you hire a HELITE airbag vest from RoadTrip and decide that you want to buy one for yourself, we will discount the price of a brand new vest by the same amount you have paid in rental. HELITE Airbag vest to buy or rent from RoadTrip. RoadTrip is now an official partner and stockist for the HELITE range of airbag technology safety clothing. For the first time, customers can now rent or buy airbag vest safety clothing – only from RoadTrip. 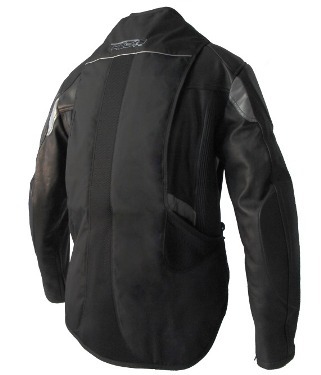 HELITE airbag vests are already popular with motorcyclists in Europe and the USA. RoadTrip offers our customers the opportunity to be the first UK riders to hire HELITE airbag safety vests. 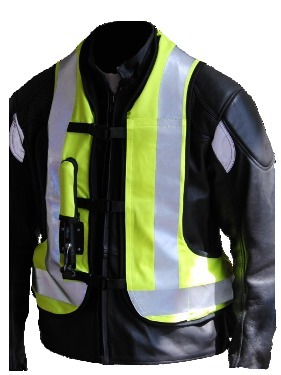 There are two different HELITE vest designs produced specifically for motorcycle use and designed to be worn outside motorcycle clothing, the Classic Air vest and the Turtle Air vest. Both incorporate Knox armour back panels and are available in black or high-viz yellow. The Turtle design provides increased back protection and HELITE Turtle technology is also available incorporated into a range of Jackets. 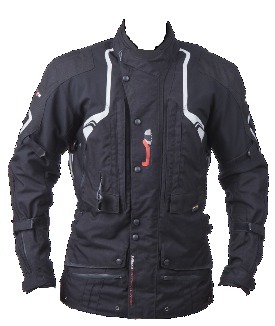 There is a rugged touring jacket in two colours, a Parka and two leather riding jackets, all designed by HELITE with built-in airbags and inflation mechanism. Call us today and we can advise you on fit and sizing. HELITE touring Jacket – black. The HELITE Airbag vests and jackets are well designed and reliable. They consists of a system of linked airbags and armour inside a rugged Polyester shell or leather jacket. 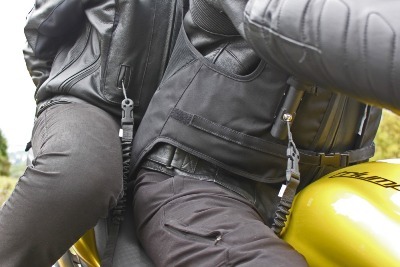 The airbag is triggered by a lanyard attached to the motorcycle. When the lanyard is pulled with sufficient force it releases a spring-loaded firing pin that pierces a small CO2 gas cylinder which inflates the airbag. The force needed to trigger the inflation is around 30kg. This means it is very unlikely that you will trigger inflation accidentally if you forget to detach the vest before dismounting normally. HELITE clothing inflates fully in less than 1/10th of a second. The lanyard stays permanently attached to the bike and clips and unclips to the vest securely and easily when the rider mounts and dismounts. Firstly, the Air vest straightens the rider’s back and neck inside a strong, protective, tubular framework of inflated Airbags. This reduces the risk of back, neck, head, and whiplash injuries. Secondly, the inflated structure cushions the rider from impact, which helps reduce and even prevent both skeletal and internal injuries. The trigger mechanism has a release valve that allows the vest to deflate slowly a minute or two after the event. 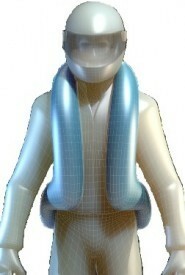 All the HELITE airbag clothing is re-usable and vests have been triggered hundreds of times during testing. If the vest is undamaged by impact, all you need to do is replace the inexpensive gas cartridge, and it’s ready to go again. You can also return Air vests to your local or UK distributor for servicing, if needed. Comfortable, lightweight, compact and discreet. Designed for both pilot and pillion. Easy to fit to any bike, reusable. Easy to reset after inflation. Strong fabric and reliable mechanism. Creates a protective cage around the torso. Straightens the spine and braces the neck before impact. CE certified and guaranteed for 2 years. HELITE was founded in 2002 by Gérard Thevenot, a French pioneer and entrepreneur in the light aircraft industry. HELITE is dedicated to developing airbag systems through a combination of knowledgeable staff and advanced engineering solutions. HELITE is also an expert in the manufacturing of inflatable protective equipment and the leading developer and first manufacturer of wearable airbag systems in Europe. Design, development and manufacturing of the airbag systems is conducted by HELITE in Dijon, France. Every single airbag and trigger system is carefully tested and quality controlled. HELITE airbags are already in use in several high-risk applications. HELITE make clothing and Airbag vests for other sports and activities, including skiing and horse riding. These vests are popular with off-road motorcyclists as well and RoadTrip can supply these as well. Please call us for details and we will advise you on fit and suitability.